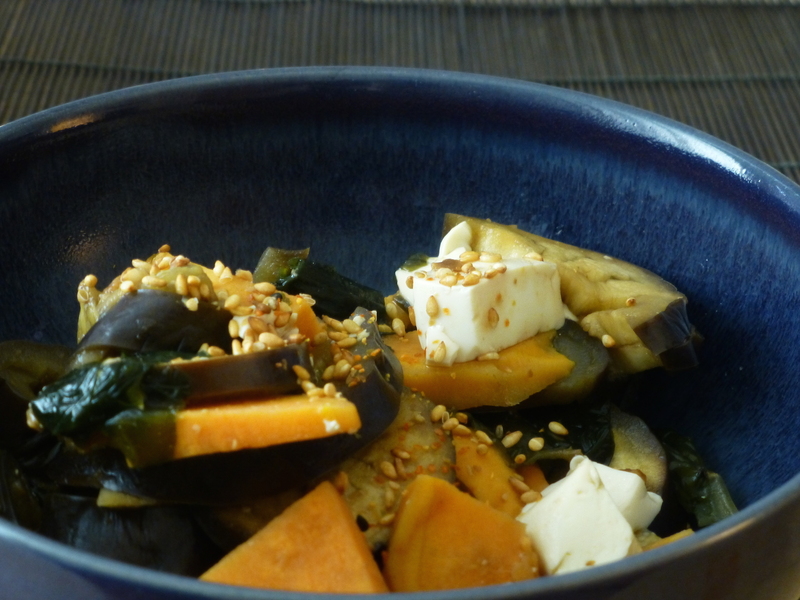 Aubergines, sweet potatoes, tofu and wakame with rice • Quick & Tasty - Get Cooking! Aubergines are very popular in Japan and there are many different ways of cooking them. Japanese aubergines are much smaller than the ones you can buy here, so I pick the smallest I can find. You need several typically Japanese ingredients for this but I bought everything in the local supermarket except the wakame, which I bought in a local Chinese supermarket. Soak the wakame in about half a liter of water. It will increase in volume by up to 6 times. Wash and clean the sweet potatoes and aubergines. Cut the aubergines in round slices of about 3-5 mm thick. Cut the sweet potatoes in pieces of about 2 by 3 cm and about 3 mm thick. Slice the ginger as thin as you can. Put the aubergines, sweet potatoes and ginger in a microwave pot and add the mirin. Cook for 8 minutes at full power (900 W). After 10 minutes, take the pot out of the microwave and pour about 100 ml of the cooking liquid into a bowl. Put the miso into the bowl and mix until it is dissolved. Drain the wakame and add it to microwave pot. Cut the tofu into small cubes (about 1 cm on the side) and add it to microwave pot. Pour the miso mixture over it and mix the ingredients taking care not to mash the tofu pieces. Cook for 3 minutes at full power (900 W). Serve with the rice and season to taste with shichimi togarashi and golden sesame seeds.